Put on your best outfit because you're invited to have tea with the Queen. Use your best manners and comb your hair, as one will no be amused if you don't! what do you know about England's Capital City? 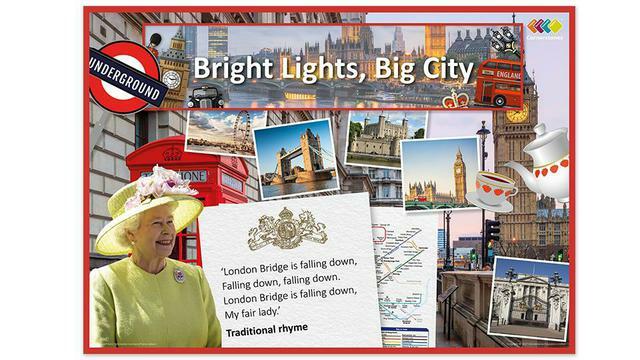 Let's find out all about London, including it's history, transport and famous Landmarks. Step back in time and discover what happened in the Great Fire of London. Where did it start? How did it end? Create a model of the bakery on Pudding Lane...then burn it to the ground to recreate the Great Fire. Stand well back and watch how the flames spread. London's Burning! London's Burning! Fire, Fire! Fire, Fire! Hang on, there's someone new in town! Plan a tour for Marley the Meerkat (he's come all the way from Zambia you know) making sure he takes in all the sights and sounds of London before he finally meets his family at London Zoo. Are you ready for the bright lights of the big city? Hop in a black cab and...enjoy the ride!